Having a beautiful smile may be even easier than you think. Many people achieve the look they've been dreaming of with our simple "teeth whitening" procedure. 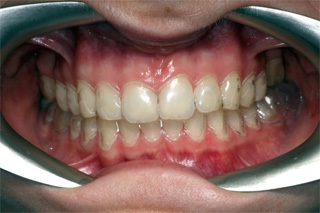 First, we will take impressions of your upper and lower teeth so we can fabricate clear custom bleaching trays. 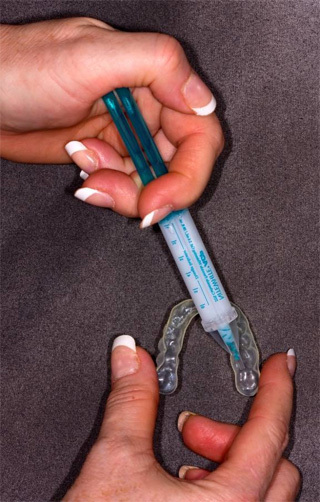 We will then provide you with a special prescription bleaching agent that you put into the clear, almost invisible trays. With only a few hours of wear per day, our special bleaching agent bubbles stains right out of your enamel in as little as one week without altering your tooth structure or existing dental work in any way. After your teeth reach the brightness you desire, you can terminate the bleaching process. Only occasional treatments will be needed to maintain your new smile. Dental bleaching can be used to correct many tooth discolorations. These discolorations may have been caused by staining, aging, or chemical damage to teeth. Using the latest in bleaching technology, we can offer a safe method for creating a beautiful, "brilliant" smile. In cases of extreme tooth discoloration, however, crowns or veneers may be the only way to achieve the smile you desire. Are "Over-The-Counter" Bleaching Products Effective? The results you can expect from using over-the-counter bleaching agents are far inferior to the results you can expect by using products recommended by your dentist. The reason for this is that your dentist can provide prescription strength whitening gel and custom trays, which fit your teeth tightly and allow the gel to remain in undiluted contact for long periods of time. Neither bleaching strips nor the stock trays provided in the over-the-counter bleaching systems have either of these advantages. Dentist-prescribed, home-applied bleaching made by a reputable manufacturer and used under the supervision of a dentist in a relatively short-term treatment duration is safe and recognized as most effective in lightening the color of teeth. Bleaching materials that have received the ADA Seal of Acceptance are recommended. Bleaching solutions have been known to cause some patients to experience temporarily sensitive teeth. In order for the bleaching process to be effective, the bleaching solution must penetrate through the enamel to reach the underlying dentin. The dentin contains microscopic tubules which allow the flow of cellular fluids between the living nerve in the center of the tooth and the outer layer of enamel. This is the reason that the teeth become sensitive. However, the sensitivity normally goes away within a few days of terminating the bleaching treatments.